Paul had been known as Saul before he became a Christian. He was born in Tarsus of Cilicia in Asia Minor. His family was of the line of Benjamin. He grew up in Jerusalem and studied Jewish tradition under the elder Gamaliel, becoming a zealous Pharisee. Paul was at first an active opponent of those that followed Jesus. He took care of the cloaks of those who threw stones at Stephen (Acts 7:58, 22-20). On his way to Damascus to persecute more believers in Jesus he was stopped by a blinding light: and he fell to the earth, and heard a voice saying unto him, Saul, Saul, why persecutest thou me? And he said, Who art thou, Lord? And the Lord said, I am Jesus whom thou persecutest: it is hard for thee to kick against the pricks. And he trembling and astonished said, Lord, what wilt thou have me to do? And the Lord said unto him, Arise, and go into the city, and it shall be told thee what thou must do (Acts 9:4-6). Paul then became a servant to Christ. And his zeal to persecute the early Christians was re-channeled into preaching the Gospel. Paul made three missionary journeys around Asia Minor, Macedonia, and Achaia. He is the author of 13 New Testament letters – Romans, 1 and 2 Corinthians, Galatians, Ephesians, Philippians, Colossians, 1 and 2 Thessalonians, 1 and 2 Timothy, Titus, and Philemon. It is also possible that he might have written Hebrews. 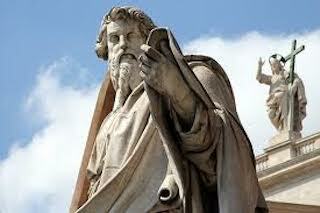 With the exception of Romans, all of Paul’s letters were written to churches or individuals whom he knew personally. The focus of Paul’s writings is Jesus, through whom God has affected redemption for all people regardless of ethnic or social background. Paul was willing to evangelize about Jesus despite great risk to himself. He was threatened, beaten, flogged, stoned and imprisoned on various occasions, but he never gave up his preaching of Jesus Christ. He might have been the most zealous and the hardest working apostle of all time. He is often considered to be the most important figure in the history of Christianity, beyond Jesus, and one of the greatest religious leaders of all time. The story of Paul is found in Acts 7:54-9:31 and 13-28.